Miami will spend an estimated $578 million on an ambitious smart grid project to insert smart meters in pretty much every building and residence in the city. Speaking at Florida Power and Light’s (FPL) DeSoto Next Generation Solar Energy Center, on October 27 President Barack Obama announced the largest single energy grid modernization investment in U.S. history, funding a broad range of technologies that will spur the nation’s transition to a smarter, stronger, more efficient and reliable electric system. The end result will promote energy-saving choices for consumers, increase efficiency, and foster the growth of renewable energy sources like wind and solar. The $3.4 billion in grant awards are part of the American Reinvestment and Recovery Act, and will be matched by industry funding for a total public-private investment worth over $8 billion. FPL was awarded the maximum $200 million grant for Energy Smart Florida is a comprehensive project to advance implementation of the Smart Grid, including installing over 2.6 million smart meters, 9,000 intelligent distribution devices, 45 phasors, and advanced monitoring equipment in over 270 substations. By incorporating intelligence into the transmission, distribution and customer systems, the utility will be able to anticipate and respond to grid disturbances, empower customers through alternative rate programs, and enable the integration of renewable and on-site energy sources. In April 2009, Miami-Dade County and Florida Power and Light announced that under the Energy Smart Miami plan, funded in part by federal stimulus dollars, the utility would install smart meters on one million homes and buildings in the county, essentially covering the entire city. Florida Power & Light, the electric company in the area, already has 100,000 in service in Broward County, north of Miami. The project, which aims to land stimulus bill funding for as much as half the project, will create as many as 1,000 new jobs as it brings next-generation technology to homes and businesses. In addition to smart meters, the project aims to install solar power systems on several schools and universities, add 300 plug-in hybrid vehicles to the city's fleet, and bring a series of new technologies like home energy use dashboards, smart appliances and smart-meter thermostats to pilot programs in 1,000 city homes. Some of the money is for sensors on the high-voltage grid, and the distribution network, including transformers, power lines and switches, to give operators a clearer idea of the condition of the equipment, and earlier warning of problems that could lead to blackout. Energy Smart Miami piggybacks on a series of already planned upgrades to the Miami area electric grid that has been in the works from FPL and California-based Silver Spring Networks. In the new project, GE will provide one million smart meters to the project, with the potential to upgrade to 4.5 million, enough to cover FPL's entire customer base in Miami-Dade. Silver Spring Networks will provide the technology to link those smart meters, and Cisco is spearheading the in-home smart devices and home dashboards in 1,000 residences. Smart-Grid Automation and Communications – More like the Internet than an electric network, the new Smart Grid system will connect Smart Meters, high-efficiency transformers, digitized substations, power generation and other equipment through a centralized information and control system. This will continuously monitor status, identify and automatically fix or dispatch teams to outages and provide useful information to improve reliability, efficiency and productivity from power generation through consumption. Smart Meters – Through the Energy Smart Miami initiative, Smart Meters will be installed in more than 1 million homes and most businesses in Miami-Dade County. Over the next five years, FPL intends to expand the project to a total of more than 4 million homes in Florida. The cost of expanding Smart Meters outside of Miami-Dade County represents a $500 million investment in addition to the $200 million proposed in support of Energy Smart Miami. Smart Meters serve as a key interface in a system that combines a number of elements – intelligent meters, a two-way communications network using open standards, and sophisticated operating systems and databases. As a result, customers will be able to go online and monitor how much energy they have used by the month, day or hour. With this information, FPL customers will have the ability to lower their electric bills by giving them substantially more information to make decisions about their electricity consumption. Ultimately, Smart Meters and the network that connects them will provide consumers with the ability to see and manage individual devices consuming electricity in their home such as air conditioning and appliances. Smart Meters will also provide FPL with information that will help it to operate more efficiently and enhance reliability. Renewable Energy Integration – Several local universities and schools will receive solar power installations to help meet energy needs with renewable, non-polluting technologies. Battery installations will enable some solar locations to store power for use during times of peak demand. Plug-in Hybrid Electric Vehicles (PHEVs) – 300 plug-in hybrid electric vehicles will be added to the FPL fleet serving Miami-Dade County. The PHEVs will be powered through approximately 50 new charging stations. Additional PHEVs will be rolled out in trials at Miami Dade College, Florida International University, the University of Miami and the City of Miami. Demand Response Software that will manage consumer appliances, lighting and other devices using Smart Meters. The backbone of Energy Smart Miami will be the deployment of more than 1 million advanced wireless “Smart Meters” to every home and most businesses in Miami-Dade County. These meters will give Florida Power & Light Company (FPL) customers more information and control over their electricity usage while also providing FPL with information that will enhance system efficiency and reliability. Implementation of the Smart Meters will be based on open network architecture, allowing other providers to develop and deploy new applications that could, for example, help consumers better manage the electricity usage of their air conditioning and appliances. Miami planned a five-year program of installing the meters, but will do it in two years if it can get the funds from the stimulus package, officials said. The partners comprising Energy Smart Miami’s expert implementation team have worked together extensively to ensure that the initiative meets President Obama’s criteria as a “shovel-ready” project to qualify for matching funds from the American Recovery and Reinvestment Act of 2009, commonly known as the federal stimulus package. Contingent on receiving this federal support, Energy Smart Miami could begin later this year and be completed by the end of 2011. The stimulus package specifically reserves federal matching grants for advanced electrical infrastructure and related initiatives targeting energy efficiency, energy reliability and renewable energy. Later, FPL will spend $500 million more to bring smart meters to the rest of its four million plus customer base. Like a lot of smart grid projects, Energy Smart Miami won't jump to energy management nirvana in one step. Most of the first smart meter deployments will be relatively simple. Only 1,000 of the homes, for instance, will be outfitted with in-home displays and smart appliances that will let consumers see their power consumption in real time and program appliances so they can cut costs during peak times. FPL also will add 300 plug-in hybrids to its Miami-Dade fleet and install 50 charging stations. Energy Smart Miami would help Miami-Dade County consumers save money by giving them more choices over how they consume and conserve electrical power. It would also generate near-term demand for “green collar jobs” to support its implementation, while further solidifying Miami’s national leadership in championing the responsible environmental practices needed to address the longer-term challenge of addressing climate change, which poses a significant threat to Florida and its coastal regions. Green Jobs - Energy Smart Miami is estimated to generate demand for 800 to 1,000 jobs, both directly and indirectly involved in the deployment, during the two-year implementation period. Dynamic Pricing (See my Blog Article) - One function for the meter would be telling the customer, hour by hour, what the price of electricity is, thus giving the homeowner or business owner the ability to limit use during peak periods, when power is more pricey. That, of course, requires pricing power by the hour. FP&L has a tariff on file now that allows this, but according to Lewis Hay III, the chief executive of FP&L’s parent company, the FPL Group, the utility has never had the technology to use it, and will probably have to develop some new rate structure for that purpose, Mr. Hay said. Interoperability – (See my blog article Standards for Standards) - John T. Chambers, the chairman and chief executive of Cisco Systems, said that while manufacturers had tried before to install “smart” appliances and other equipment that could be digitally controlled, it was not practical until the Internet was more fully developed. “God could not make this work over 350 different protocols,” Mr. Chambers said. Now, he said, technology would allow a standard communications protocol so that the grid and appliances could talk to each other. General Electric Fairfield, CT (NYSE - GE)-A world leader in power generation, distribution, and management technology, will supply key components of the project, which include Smart Meters and may extend to advanced applications and smarter control systems. 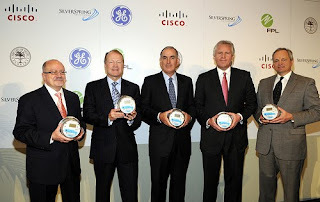 General Electric has global operations in five segments: Energy Infrastructure, Technology Infrastructure, NBC Universal, Capital Finance, and the Consumer & Industrial divisions. Cisco Systems - San Jose, CA (NASDAQ: CSCO) - The worldwide leader in networking technologies will help design and implement a secure and intelligent communications platform within the county’s transmission and distribution grid and provide customers with home energy management information and controls. CISCO formally entered energy management in January when it unfurled its EnergyWise software for controlling power consumption.